After all 12 of the trip participants arrived in Athens, we boarded a plane to Chania, a small city in the western end of Crete. We collected our soggy luggage and headed out into the dark, rainy night to meet our bus. Although we arrived at our hotel around 10:30PM, I was determined to get up early the next morning to take some pictures. Somehow my excitement at being in Greece overrode any feelings of jet lag. On a January morning, Chania's harbor looked like a ghost town and yet I could sense how beautiful and busy it must be in the summer tourist season. A few locals scuttled to work in the cold. I followed their example and walked as far from the water as possible. 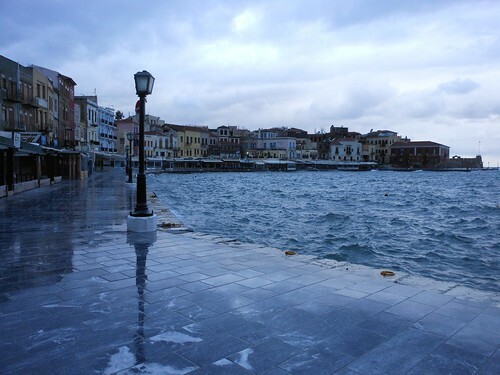 Though occasional waves crashed over Chania's harbor, the jetty and Venetian lighthouse provided a sense of calm inside the walls. 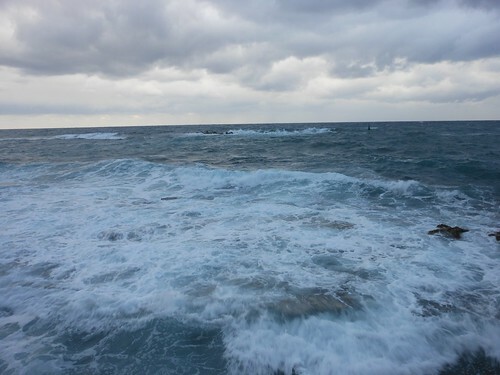 Outside, however, the sea was crazed. Its fury scared me and suddenly I understood why the ancient Greeks just didn't sail at all during the winter. 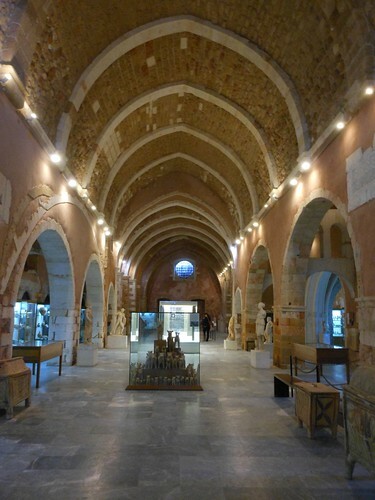 Chania has a small, but excellent archaeological museum. We saw some impressive Minoan seals, pottery, and sarcophagi, as well as linear A and B tablets. The bulls, pictured above at center, are votive offerings to Poseidon. 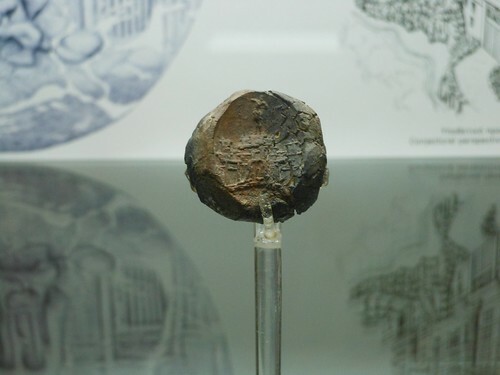 We all spent some time looking at this amazing Minoan seal ring depicted a man standing on top of Chania's Kastelli Hill. He is holding a staff while building marked with the horns of sacrifice are all around him. In the afternoon, the group had free time to explore the city. Rain and even hail impeded our wanderlust, but slowly the sky cleared. The waves hadn't settled down though and I certainly wasn't the only one to have gone too close to the water's edge only to be drenched. This was a happy mishap though, and my face tasted like salt for the rest of the night. 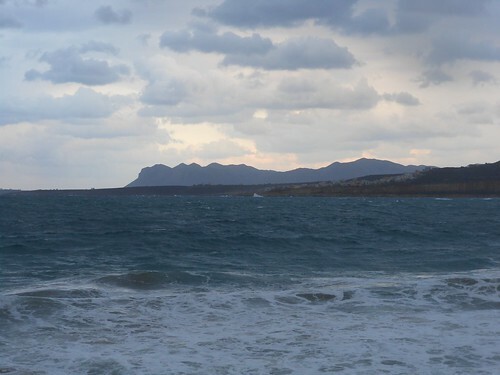 The next day, we headed east to central Crete. 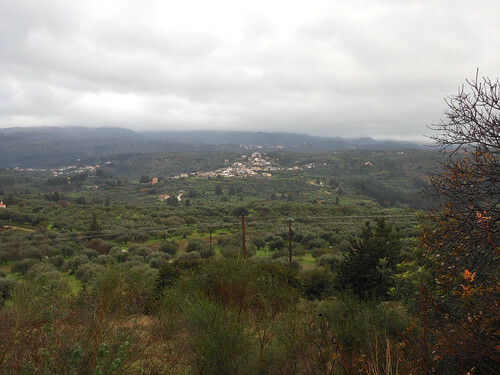 The road from Chania to Iraklion is stunning with its fertile green hills of orange and olive trees as well as grape vines. We arrived in Knossos, the political, administrative, and religious center of Minoan civilization. Arthur Evans has irreparably left his mark on this site; here are his concrete horns on consecration. I think on a future trip I would visit Knossos after having seen Phaistos. 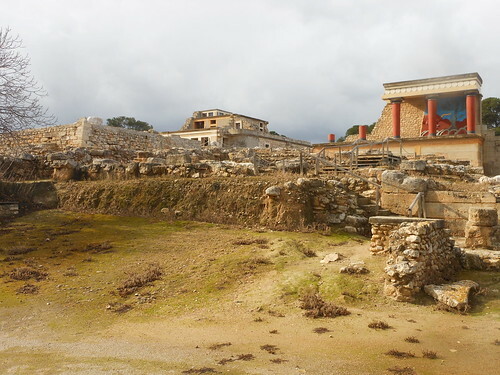 Knossos is so big and all the more complex due to the reconstructions. One member of our group pointed out that the elevated walkways prevent you from approaching and interacting with the space in a historically accurate way. 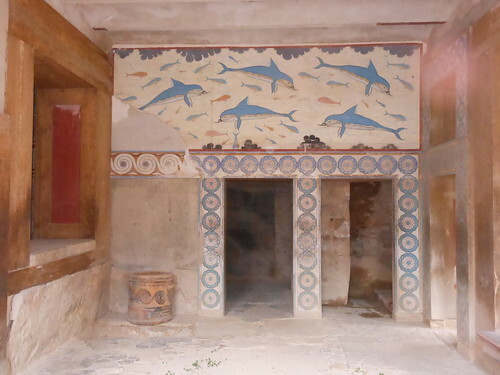 Though I sometimes found the reconstructions confusing, I did like that how showed how colorful and bright Knossos was, both inside and out. Even as a ruin, Knossos still impresses. 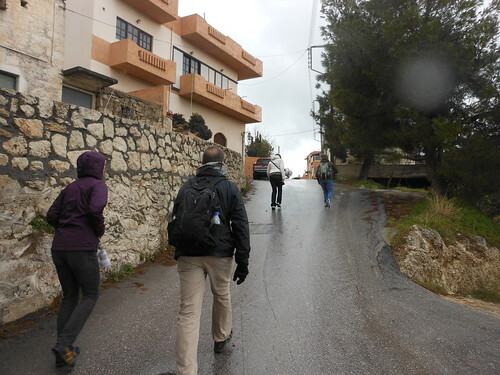 The rain and hail caught up with us at the next stop: Phourni, a Minoan cemetery. 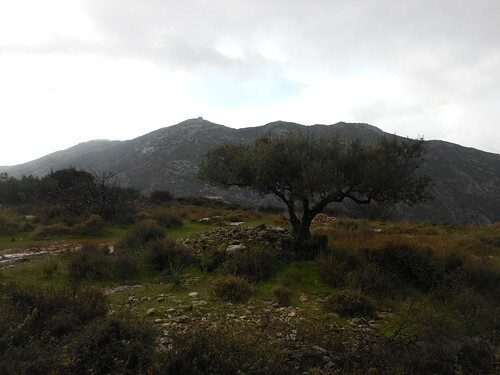 Despite the weather, I enjoyed a beautiful walk up the mountain. A friendly dog kept us company and heading in the right direction. Unfortunately, when we finally reached the entrance to the cemetery, it was closed. Still, I'm glad to have gotten this magical picture. 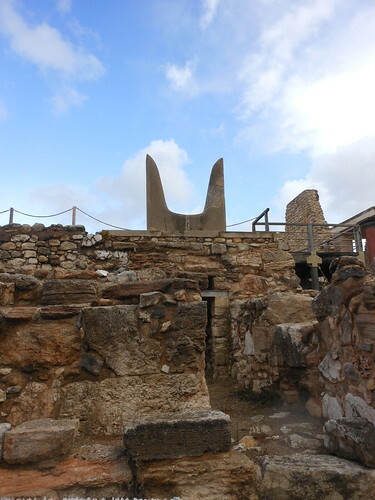 We left the Minoan world for a foray into modern Crete and its capital, Heraklion or Iraklion. This gritty, but lively and -- I 'll even go as far to say -- enchanting city has truly labyrinthine streets with appropriate names (like Ariadne). 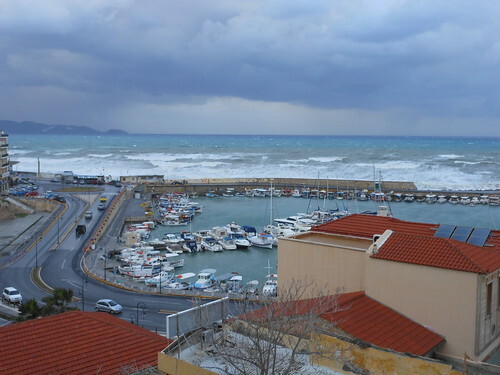 From my window at the Hotel Lato, I could watch the racuous waves and, even as I tried to fall asleep after a tasty meal, the howling wind kept me from drifting off.